Meetings are the second Tuesday of each month at 7:30pm in Aigburth Vale. Meetings are not held in June, July, August, and December. All Aigburth Manor residents are invited to attend. Annual dues are $30 for a family or $15 for an individual, payable in June/July. You can download the 2017-2018 MEMBERSHIP APPLICATION. While dues are voluntary, we encourage you to support the Aigburth Manor Association of Towson. Officers are elected at the May general meeting and serve until the following May. Aigburth Manor is Towson’s first planned suburban development, begun in the 1890’s on the grounds of Aigburth Vale, the mansion built in 1868 by John Owens, a world-renowned comedian and dramatic actor. During Owens’ lifetime, Aigburth Vale was his summer home, a place where he entertained notable theatrical, literary, and political figures, and enjoyed the leisurely existence of a well-to-do country gentleman. 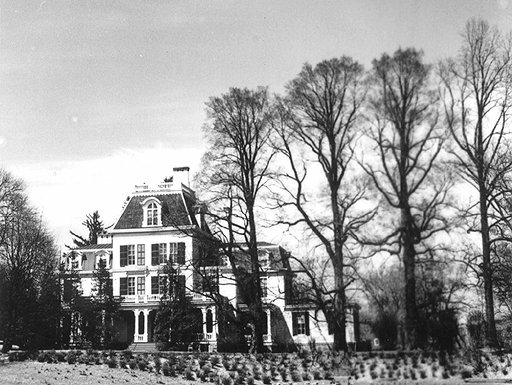 After Owens’ death in 1886, the mansion and surrounding estate were purchased by the Maryland Real Estate Company to turn it into a summer resort community. The 1898 atlas (see Historic Photos page) shows the area laid out essentially as it is today with 228 generous-sized lots just beyond the heart of the town, yet within easy walking distance of downtown. Today, Aigburth’s homes still maintain the ambiance of a summer community. Lots are spacious, with tall trees shading the homes and gardens. The homes are set back from the street, creating a feeling of a leisurely and uncrowded existence. A variety of architectural styles can be found, from early clapboard Victorians, to English Country Cottage and Colonial Revival styles, reflecting the 40-year span of construction in Aigburth. The restored Aigburth Vale mansion is now part of a senior rental community managed by St. Ambrose Housing Aid Center. Homes in Aigburth exhibit a variety of housing styles on spacious lots with large trees and beautiful landscaping, evidence of the long history of gardening in the area. Scharff’s 1881 History of Baltimore City and County mentions that this area was notable for its “handsome cottages and other residences” and “its cultivation of attractive gardens around their homes.” Homes vary in style from stone residences in the English Tudor style, to clapboard Victorians and traditional Colonials. Aigburth is one of the most convenient communities in Towson in which to live, particularly if you like to walk. Residents frequently walk to school, to college, to church, to the Towson Library, and even to the Towson Town Center (if you are energetic!). A short drive north on Dulaney Valley Road will put you on the Beltway, and south on York Road provides easy access to Baltimore City. Aigburth is within minutes of any type of shopping one could desire. Grocery stores are located nearby either north or south in full-service shopping centers with banks, pharmacies, and other service locations. Along York Road, you can buy everything from a new car to pizza. The Towson Town Center provides upscale shopping for the discriminating buyer. Stores in downtown Towson provide an eclectic mix of shopping, including artist supplies, gift and cards, decorating, antiques, bakeries, and resale shops which appeal to the college students from Towson University and Goucher College. Residents of Aigburth have a choice of many nearby churches of worship, including First Lutheran, Ascension Lutheran, Trinity Episcopal, Towson Presbyterian, Immaculate Conception, and Woodbrook Baptist. 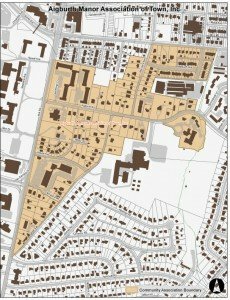 Children in Aigburth attend Pleasant Plains Elementary, Stoneleigh Elementary, West Towson Elementary, Dumbarton Middle, and Towson High School, which is located within the community on what was the racetrack for the Aigburth Vale mansion. Towson University is right across York Road; Goucher College is located just north of downtown Towson. Private schools are also nearby. Aigburth belongs to the Towson Recreation Council, which sponsors many recreation activities for children and adults, The fields of Towson High School are often used by the residents for a wide variety of recreation, from pick-up softball games, to dog walking and picnicking. Adapted from a brochure prepared by The Towson Partnership Community Conservation Committee and the Office of Planning.